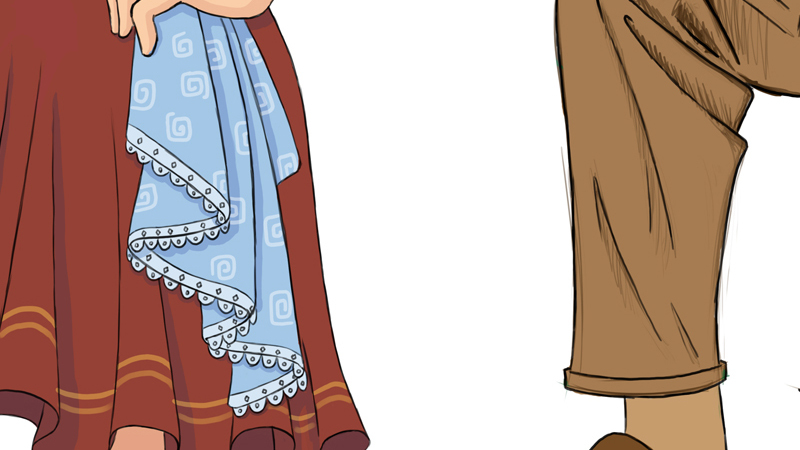 Are you interested in painting or drawing clothing more convincingly on a character? Maybe your fashion designs appear unnatural or flat in relationship to the body. 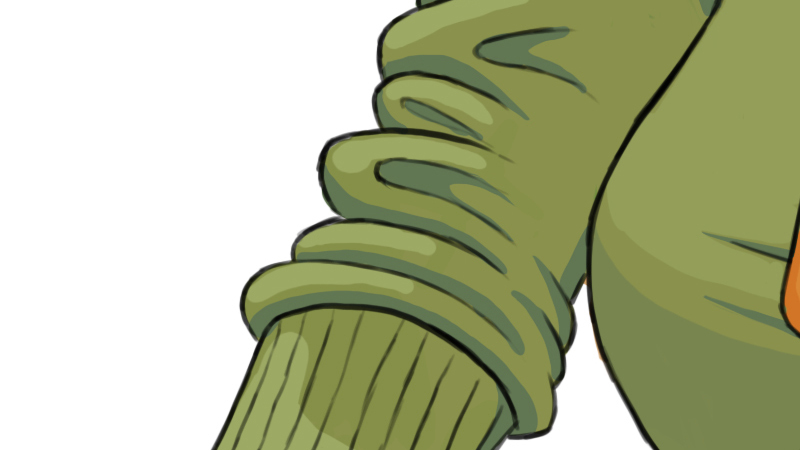 Then having a good understanding of the various types of folds and how they wrap around the human form will help you achieve better visual results when illustrating clothing. Folds show depth and volume for forms that are large or small underneath a given material. Folds can also visually support an action or motion in a form. A good place to start is by studying the human form and breaking down various body parts into simple shapes. By determining how they appear in three dimensional space you can begin to apply clothing hemlines and edges that follow the contours of the body accurately. When it comes to the edges of different materials you'll want to be sure to maintain a sense of volume so the articles of clothing do not appear skin tight. Being mindful of your line work and how you wrap a material's form around a specific body part will determine this. Once you have established how these hemlines and edges of clothing will be placed on the body you can start blocking in articles of clothing. Depending on what part of the body the clothing is being applied to will produce a specific type of fold. There are some common fold types that occur which you'll need to become familiar with. 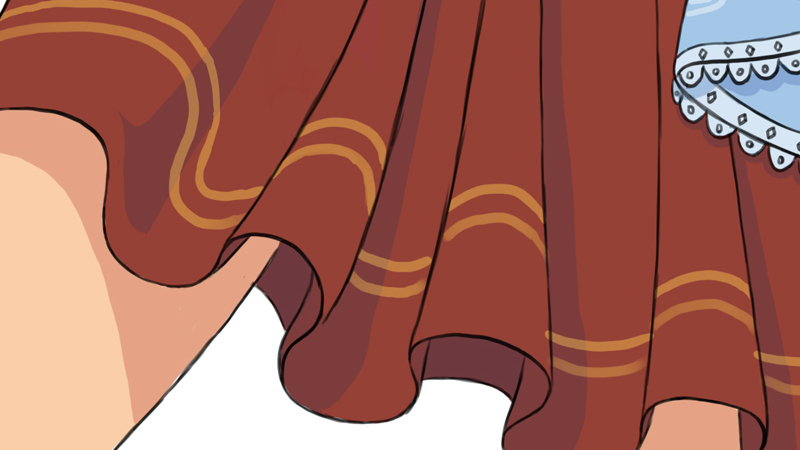 Pipe folds tend to occur on dresses and curtains. This happens when the origin point of the material is compressed or bunched together while the other end that is hanging loose is not. Creating a series of semi-tubular shapes to form as the material hangs free at the opposite end. The bottom part that is hanging free often has a wavy pattern to its appearance. 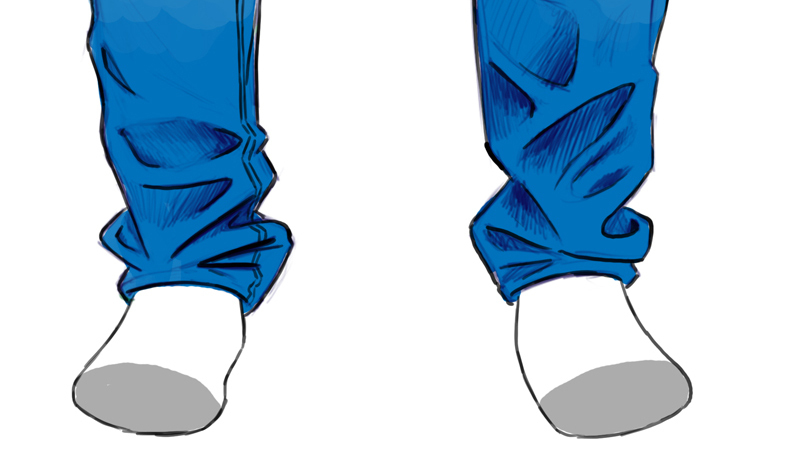 Zig-Zag folds tend to occur where pants bunch up at the bottom of the legs or behind the knees due to compression of the material. They're basically folds that tend to alternate one another in a zig-zagged fashion with areas that fold inward on itself. When drawing this type of fold try to start with a zig-zag guideline that feels organic and not too uniform. This will provide you with a more natural looking result. Spiral folds often occur on sleeves that have been rolled or bunched up. These folds only happen on material that is being wrapped around and bunched up on tubular forms such as an arm or a leg. Half-Lock folds tend to occur where there is an abrupt change in the direction of the fabric. If you have ever seen a golfer that is bending his body in preparation to swing his club you'll sometimes see these types of folds in the upper part of the pants where the body is bending forward. Slacks tend to show this type of fold really well. Another area you'll see this type of fold will be on the sides of the knees when a person is squatting or seated, causing an abrupt change in the direction of the material to pop out on the sides. Diaper folds are a result of sagging in a material between two support points. Depending on how much fabric there is and the distance between the support points will dictate the amount of slack in the material. 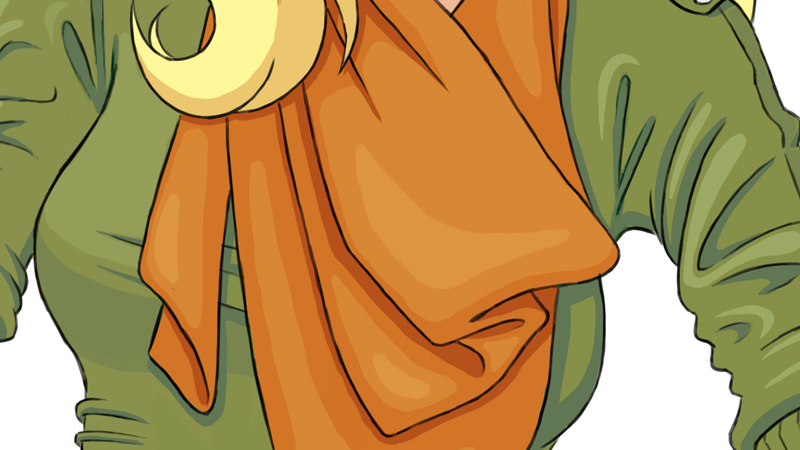 You'll often see these types of folds on scarves and handkerchiefs. Drop folds commonly occur where a material simply drops off of a form to hang freely. The overall look of a drop fold is dictated by the form the material is hanging off of and gravity. Imagine a towel hanging on a hook. This type of fold tends to sneak its way into some other folds you might be working with in the design of your clothing. It's also important to note certain types of fabric fold differently so spend some time researching and experimenting with a variety of materials to gain a stronger sense of how they can be manipulated. The thinner the fabric or material the more easily it can fold or crease. The folds will be closer together and more abundant. The thicker the material the harder it is for folders to occur. If there are folds, there are only a few. The softer the material the rounder the folds can be. Try setting up a light source to view these different types of folds to clearly establish them on the form. This research will help when it comes to rendering the fabric. Once you have become better acquainted with these types of folds and their relationships to the human form you'll be able to combine them in a cohesive manner and design more convincing articles of clothing whether you're a fashion designer, an illustrator or painter. 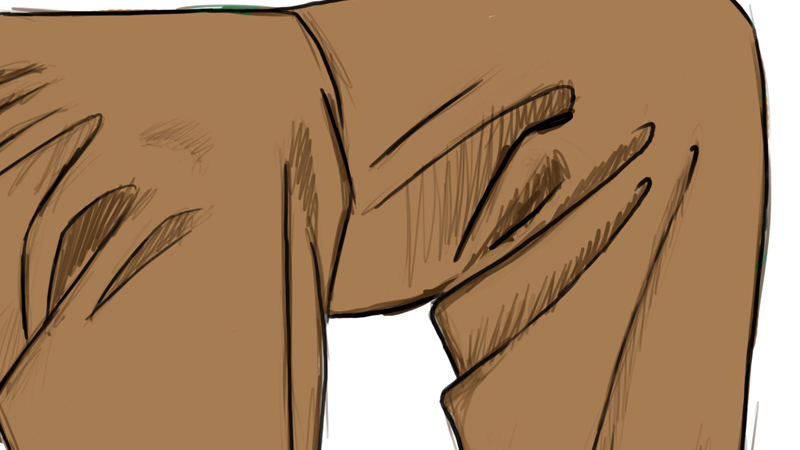 To learn more about drawing more realistic clothing for your characters check out the Illustrating Form and Folds for Clothing tutorial.